The full Executive Cabinet of Nicolas Maduro was sworn-in last Monday. Now it will get even bigger. Because having more than thirty Ministers, six Vice-Presidents and six Regional Coordinators was not enough for his Cabinet, Nicolas Maduro has now named three brand new Presidential Commisioners to help him out. One of these commisioners will be in charge of “Strategical Affairs of Government”. Sounds pretty important. Perhaps it is, as Deputy Foreign Minister Temir Porras is taking the job. The other two will be in charge of “Economical and Financial Affairs” (Wait a minute… they’re already Ministers for that!) and the Chinese-Venezuelan Joint Fund (Fondo Chino) respectively. 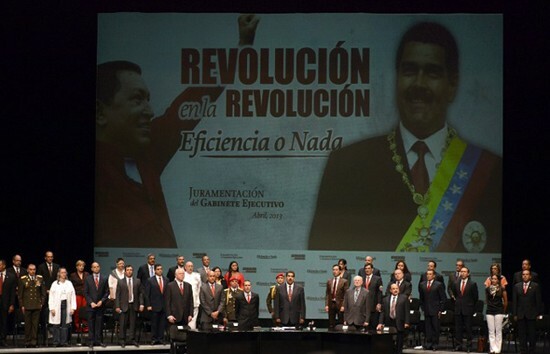 Maduro wants to make government more efficient and less corrupt and what does he do instead? Make it bigger and more vulnerable to inefficiency and corruption. GENIUS! One more question… what is an Economic Military Zone? Because I never heard of it before. UPDATE: Carlos Erik Malpica Flores, the new Presidential Commisioner for Economical and Financial Affairs is actually a family relative of Cilia Flores. And that’s not all, he will also have a second job as part of the National Treasury Office.